The Tasmanian jury study investigated whether juries could be used to gauge informed public opinion about sentencing. To help them debrief, jurors were invited to share their views of the jury experience itself and to ask questions or raise concerns that emerged from their jury service. This paper discusses some of the major themes that emerged from this aspect of the interviews and highlights their implications for trial management, court practice and jury instruction. 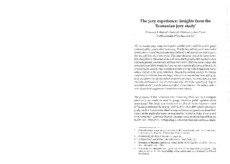 While the authors report that jury experience (albeit stressful and intense) had a positive effect on confidence in the criminal justice system, they identified a number of factors which they found had an adverse impact on the juror experience. These factors include, among other things, sensitivity to criticism from the judge; reluctance or uncertainty about asking the judge questions; lack of information about jury processes, including jury selection and jury deliberations; and misunderstandings about the meaning of "beyond reasonable doubt", and the nature and effect of oral evidence. The authors make a series of practical suggestions to ameliorate these impacts.